Product prices and availability are accurate as of 2019-04-23 01:46:17 UTC and are subject to change. Any price and availability information displayed on http://www.amazon.co.uk/ at the time of purchase will apply to the purchase of this product. This acrylic wall display case has a gloss black acrylic back panel, which is fitted to the wall using quality stainless steel sign supports, these are screwed to the wall, but they leave no visible sign of the fixing screw. The 8 shelves are then fitted to the back panel using some clear acrylic clips. The shelves themselves are made from clear acrylic, so they help to keep light moving throughout your display case. The shelves measure 432mm long, 96mm deep, and spaced 96mm apart. The shelf brackets protrude into the shelf by 11mm on the top of the shelf and 25mm underneath the shelf. The front cover is also made from clear acrylic and is fabricated into one piece, it has hooks down each side which slot into the back panel, this gives a good fit, that will be dust proof and difficult to know off the unit by accident. To remove you just push it up and then lift it away. The acrylic used will protect from over 90% of harmful UV light. Overall this is a high quality wall display cabinet and is made in the UK. This display case measures approx 460mm wide x 545mm high and 125mm depth. 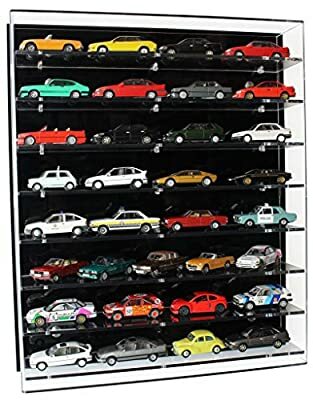 Diecast Devon Store is a participant in the Amazon Services LLC Associates Program, an affiliate advertising program designed to provide a means for sites to earn advertising fees by advertising and linking to Amazon.co.uk, Endless.com, MYHABIT.com, SmallParts.com, or AmazonWireless.com. Amazon, the Amazon logo, AmazonSupply, and the AmazonSupply logo are trademarks of Amazon.com, Inc. or its affiliates. 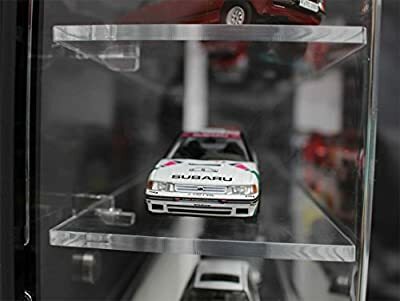 Diecast Devon Store Copyright © 2019. All rights reserved.